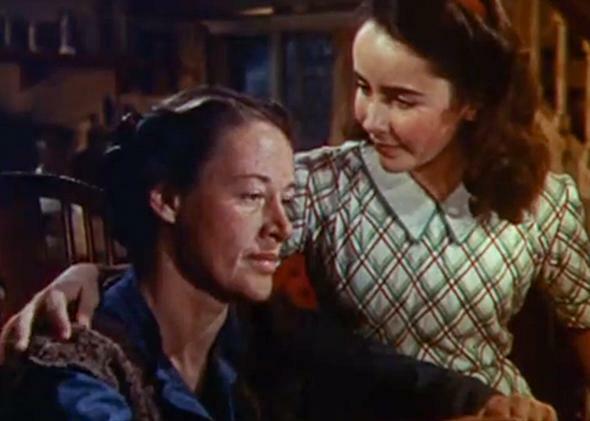 National Velvet: Anne Revere’s Araminty Brown is one of cinema history’s greatest mothers. What I learned about being a mother from National Velvet’s Araminty Brown. But paging through the section of the book titled “A Gallery of Golden Age Moms,” one entry caught my eye: It was the brief page and a half Corliss devotes to Anne Revere, the statuesque and stern-faced actress who won an Oscar for playing Elizabeth Taylor’s mother (and Mickey Rooney’s employer and mother surrogate) in the beloved 1944 horse-racing drama National Velvet. Revere’s character, the formidable butcher’s wife and former English Channel swimmer Araminty Brown, has to rank among my top few movie mothers: She’s an indelible and mysterious figure who, no matter how many times I watch National Velvet (and now that my daughter loves the movie too, I must be moving toward at least a dozen total lifetime viewings), always has new depths to reveal. That last bit of wisdom is picked up by the notably rangier and more philosophical Mrs. Brown of the movie version of National Velvet. “There’s a right time for everything,” Araminty assures her daughter, explaining why she hasn’t yet revealed the full story of her past to Mi Taylor (Mickey Rooney), the son of the man who, many years ago, coached her through that grueling Channel swim. Mrs. Brown’s long-past athletic achievement hovers like a ghost—a benevolent one—over the film. It’s her deep gratitude to Mi’s recently deceased father that convinces her to take the vagrant lad in as a butcher’s shop assistant, and it’s her long-saved-up prize winnings, a bag of gold sovereign coins, that will pay for Velvet’s eventual entry fee to the Grand National. National Velvet tells, in some sense, the story of the supplanting of the mother’s moment in the sun by her daughter’s: Velvet’s training with Mi for the big race is a generational echo of her mother’s long-ago apprenticeship with his father. But Araminty’s passing of the torch has none of the martyrly self-sacrifice of, say, Lana Turner’s ceding her lover to her spoiled, oblivious daughter in Imitation of Life. Rather, there’s a Buddhist equanimity to Mrs. Brown’s restrained but evident joy at helping her dangerously “lit-up” daughter realize the dream her mother calls “a breathtaking piece of folly”: capturing the Grand National title with a rough country horse she won in a raffle. The wise, practical Araminty and the perpetually daydreaming Velvet share a common belief in the nobility of folly, as well as a thirst for glory for its own sake (or in Velvet’s case, for her horse’s), a non-egocentric drive to work and succeed and excel.